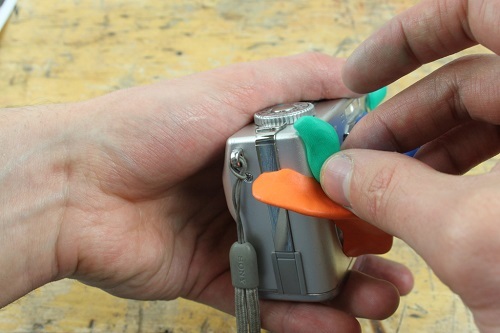 To make the basic sugru walls for your camera, cut open and knead your sugru. Roll it into a sausage shape and then make it into a long pyramid. 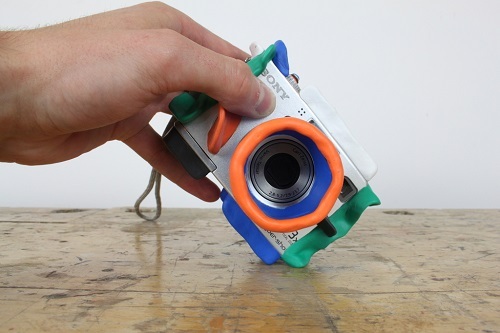 Place and push it onto your camera. Leave it to cure overnight vertically so it doesn’t drop and flop over the one side. Now we are going to build up the lens ‘wall’. You build the lens wall the same as you would any sugru wall for this camera, but this has to be circular and be quite high (enough to cover the lens, roughly 4.5cm). Because of its height it is probably best to build it in two parts out of TWO sausages. Start by creating two sausages the same length as the circumference of the outside of the lens. Remember your sausages should be about 1cm in diameter to ensure a strong wall. 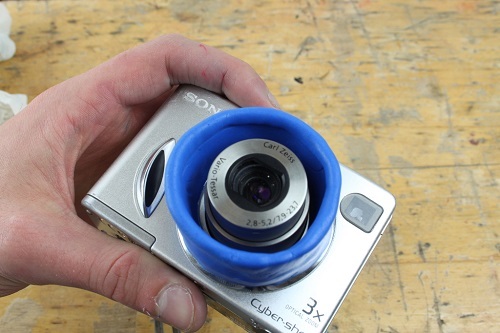 Place your first sausage round the lens ensuring the bottom edge is firmly stuck down. 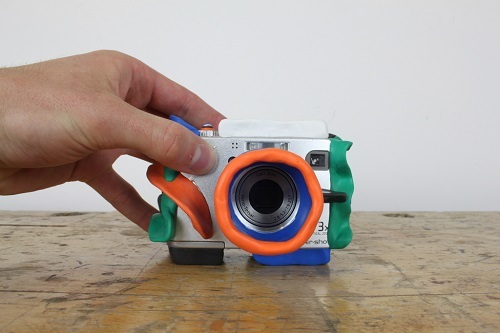 Turn on the camera so the lens comes out to ensure that your sugru wall will not prevent it from extruding. Check this regularly while developing the wall. Once you have created a foundation with your first sausage, use your other sausage of the same size and place it on top of the foundation wall. Then build up the wall in the same way as before until it is higher than the lens. Smooth over any join marks gently with your fingers to get a nice clean finish. We found that when building the lens wall, it would sometimes grow outwards rather then straight, if this happens just fold over the walls and push together to bring them in. Then smooth over the join with you fingers. Keep checking that the lens can open out properly. Continue to build up your wall until it is higher than your lens. Smooth the surfaces with your fingers but be gentle as to not damage your wall. Leave the camera on its back to cure so that the wall remains straight. Also make sure to protect your screen too! Now its just a case of covering the camera with enough walls so that if it is dropped from any angle it will be protected! These walls don’t need to be quite as high as the lens wall. We would recommend going for about 2 cm. 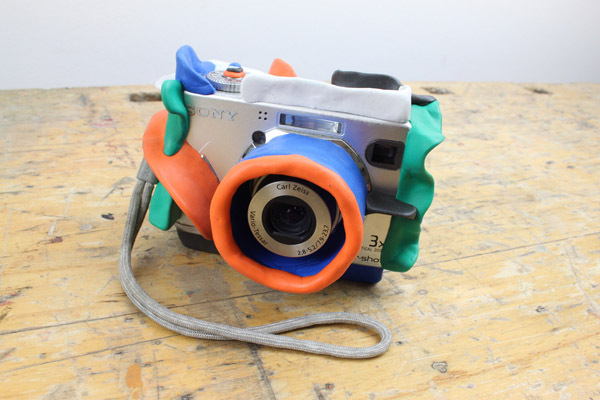 As this is a camera for kids it also seems like a good idea to use the full range of sugru colors available. It is best to build up your walls a side at a time (top bottom, front and back) allowing the walls to cure overnight before starting another side. TOP TIP: When leaving the walls to cure leave them vertical to help keep them straight. Because there are so many parts to a camera (such as buttons, dials, battery cases, flashes etc) it is important that you do not cover them with your walls. Make sure your walls go around these elements so that the camera is fully functional once the hack is complete. 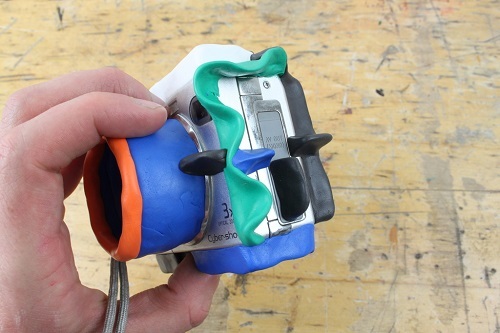 If you do make a mistake, you can always remove sugru! Once your think you are all done and have left your final walls to cure for 24 hours (this time is necessary for an aggressive use hack such as this) it is worth checking that you camera is fully protected before handing it over to the child. Once you’re happy, then your awesome bouncy kids camera is good to go forth and capture amazing shots!